Webcomic creator Carlo Jose San Juan takes the hot seat to answer questions about Callous Comics and his new sci-fi webcomic M.O.U.S.E. 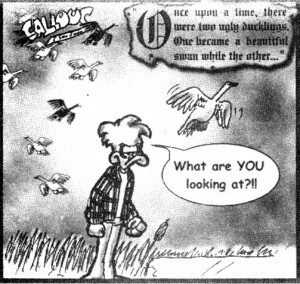 Q1: What is ‘Callous‘ the comic strip about? A1: Wow, over the years that has become a loaded question! Ha ha! Primarily, “Callous” is about the life and times of Dr. Rianne Nicah, a struggling new physician, who also happens to have a Guardian Duck named Cal Duck. Throughout the years of studying and training to become a Family Practice with Obstetrics specialist, she never really got to discover herself as a person and the world around her. Cal showed up to help guide her to become the best person she could be by opening her eyes to everything she ignored within herself, the medical field, and the world we live in. That’s all well and good but there is a catch. Cal isn’t invisible. It’s also his first time to become a Guardian Duck so he is often accompanied by his on-the-job mentors, Mallard Duck, Decoy Duck, and Ling Duck, who all have the ability to pop in and out of our world to guide Cal. In the effort to maintain as normal a life as she could, Rianne has requested that the ducks remain within her home to which they reluctantly agreed. Nevertheless, she has gained good friends in her otherworldly housemates. However, for one reason or another, Rianne would occasionally be transported to the world of her Guardian Duck friends where she’d find herself in the middle of fantastic adventures! But that aspect of the series is a totally different monster to talk about! Q2: Why Ducks? Do you have a pet Mallard or something? A2: Ha ha! No, I just find them cute. I guess it started back when I was still in elementary school. There was a petting zoo in my school and it had a little duck pond. The mother duck was actually pretty accommodating and even let us carry her ducklings. I would find the way they waddle about and even their quacking kinda funny but I would marvel at how graceful they are when in flight. Since then I’ve had a thing for cartoon ducks. Ducktales, Count Duckula, Disney’s Donald Duck, Wade Duck from Jim Davis’ Orson’s Farm, and even Marvel’s Howard the Duck were notables from my youth. 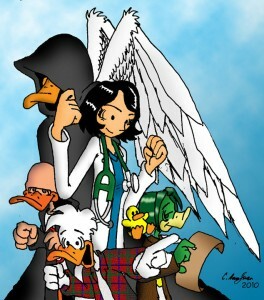 However, my absolute favorite would be Daffy Duck of the Looney Tunes gang. So it was only a matter of time when I’d come up with my own cartoon duck! A3: Before Cal appeared in her life, Rianne was a very closed-minded person and an extreme creature of habit. Perhaps it was due to her focus on advancing her medical career, which is fair, but it nevertheless hampered her personality’s development. Cal’s sudden arrival into her life was the first catalyst in her breaking out of her prison of routine. So bit by bit Cal would entice her via passive suggestions to break her instinctive routines, all through her own volition, so that she’d be exposed to new things. These things have an effect on her character and help her grow. These “new” aspects of her life with Cal can range from simple, everyday things to major decisions. They can be as seemingly miniscule as changing the color of her ballpen from black to blue or quite grand like opening herself up to a meaningful relationship. Hence, the tagline of the series has been “Brave the World”. To find yourself by opening up to all that life has to offer. There are aspects that she might not like but she’d never really know until she experiences them herself. She might not become the best person in the world but she’ll definitely aim to become the best “Rianne” she can be. 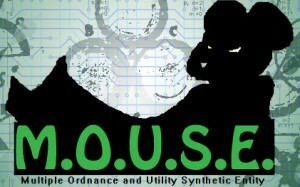 Q4: I see you recently launched a new webcomic, M.O.U.S.E. Tell me about it. A4: M.O.U.S.E. (Multiple Ordnance and Utility Synthetic Entity) is about a brilliant robotics and cybernetics student who was mistakenly assigned to intern at a mad scientist’s laboratory. It’s a big fantasy/sci-fi/adventure tale and I’m really excited about it! I’m also extremely fortunate to be working with Pilar Esber as the series artist. She’s brought a sense of energy and fun through her art which makes the comic quite rich in character. Q5: What is it like working with another artist versus making a comic solo? A5: When working on Callous I’m able to portray exactly what I imagine. With M.O.U.S.E., I let Pilar have control of what everything looks like, including how my story flows through the page. It’s a different kind of thrill, like watching a theatre group perform a play you wrote or like seeing how a guest artist draws your characters. The way Pilar has been interpreting my writing is fascinating and is ultimately rewarding in itself. CLICK HERE TO READ PART 2 OF THE CALLOUS COMICS INTERVIEW!